So gamma islands are back, you’ve been busy there for 3 weeks already. With the expected small hotfixes out of the way we can say that we’re happy with how things went down, we hope you’re having a good time too. This brings me to the main announcement of this blog. As outlined in the previous status report, once we’re looking at a stable gamma system, we’re ending our Early Access phase on Steam. Originally the EA phase was meant to be quite short, basically to make sure that our new servers work as they should and our integration with Steam is flawless. But because of the removal/revamp of gamma islands the game has lost a large chunk of its content, we decided to extend EA until it’s finished. Of course we could still wait until we’re done with the mission system revamp, and with new PvE content, and the new engine, and and and… but that would be a vicious cycle and we’d be stuck in there forever. With the new changes of the Steam UI it has also become even less desirable to stay in Early Access for longer than absolutely necessary, simply from a visibility standpoint. So with that said, we’re officially launching on Steam this Friday, the 17th of October. And as it is the case with all newly launching games, Perpetuum will be -10% off for a week. Of course this won’t really change much from a development perspective, we’re continuing on the road we have laid out and keep improving the game. We’re also planning a small patch for this Thursday (version 3.5.2), with a few bug fixes, and something that we wanted to do for a while now. This is a reworked mineral spawning system, which won’t mean too much difference in gameplay at first, but it makes our lives easier and it’s also more optimal for the server and the database. To get a bit more technical, mineral fields so far have been generated and stored in raw bitmaps, and “fields” as a concept did not actually exist. Minerals in ground tiles had no connection to each other, and we couldn’t tell whether two tiles belonged to the same mineral field or not. This made it practically impossible to create rules and mechanics that would affect a whole mineral field. With the new system, fields are node-based and are stored hierarchically in the database, which makes it very easy to let a whole field despawn without any residue after a certain time for example. The system is very different compared to the current one, which will result in all the mineral fields being reset, so please be aware of this. From a balancing standpoint we’ll also take this opportunity and make the faction-specific mineral difference even more significant, going from a 1:1.5 ratio of non-faction:faction minerals on an island to a 1:2 ratio. Two relatively small but very significant changes will happen here, based on forum feedback and our observations, which will be deployed in the patch after the next one (3.5.3). The change related to gamma islands is that we’ll be lifting the limit of 3 terminals per island. We have anticipated this change and mentioned before gammas were opened that we’re playing it safe but this might happen, but now we’re sure it has to go. 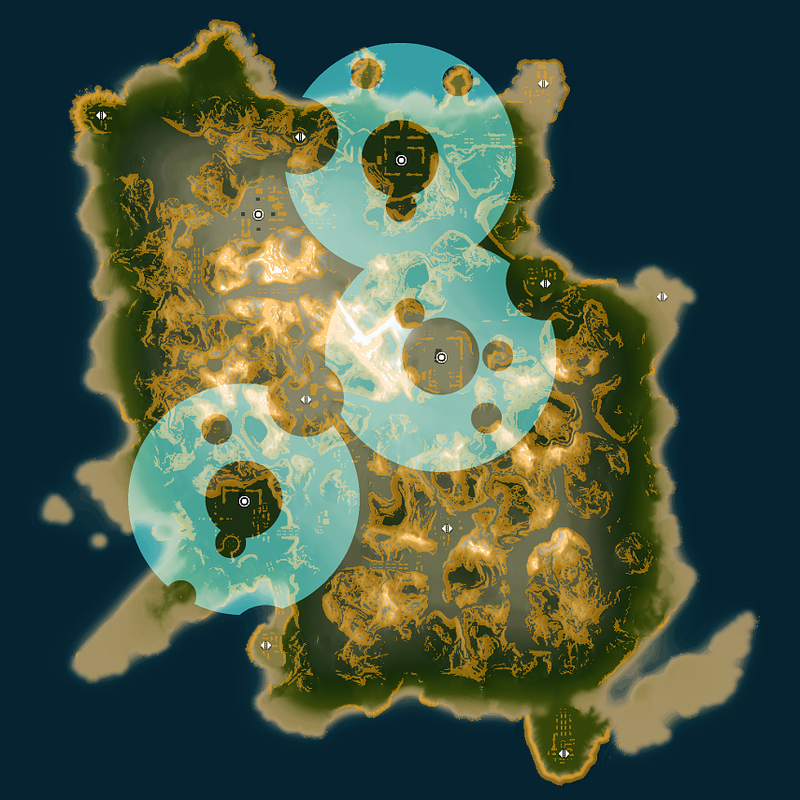 The remaining terminal-to-terminal range limit and the red no-build areas should be enough to provide a soft limit for the number of terminals on an island. The change to intrusions will bring an end to the automatic stability increase of beta outposts, and will require the owner corporation to complete their own SAP events as well. This will be the only way to increase the stability of outposts; if an event happens without any interaction then the stability will remain unchanged. Attacking corporations completing SAP events will of course still reduce stability, like they do now. As a result of this change, intrusion events should be more fast-paced and straightforward as defenders won’t have to stand around for two hours waiting for someone to come, but it will also require more effort to keep an outpost stable. We’re preparing a larger balancing patch that affects pretty much every robot in the game. The general aim is to boost light and assault class robots, and to stimulate or rather make room for a larger variance in weapon and module choices for all robots. Light and assault bots get additional head and/or leg slots. ...and a 25% mass increase, so equipped modules don’t affect their speed that much. The current faction-specific weapon damage bonus of all combat robots will be changed to a combination of a larger general weapon damage bonus plus a smaller faction-specific weapon damage bonus. This means that your robot will be less “crippled” when using weapons other than its faction-specific ones. Weapon-specific bonuses of assaults and mechs will be size-independent, so assaults will receive bonuses for medium weapons, and mechs for light weapons too. All robots will receive an extra bonus that is either connected to their intended role or their faction. We’d like to emphasize the scout role of light combats, so they receive a detection bonus. Combat assaults receive an optimal range bonus in order to take on longer-ranged mechs more easily. Light EWs get a small bonus to their faction-specific weapon cycle times to increase their combat capabilities a bit. Combat mechs should be as agile as possible on the battlefield, so they receive a bonus to demobilizer resistance. EW mechs’ main role is to disrupt from the distance, this means an EW module optimal range bonus for them. Combat heavy mechs, being the slow fortresses they are, receive a small survivability boost with the help of armor resistance bonuses. Industrial light robots get an accumulator capacity bonus giving them more working stability or even survivability, depending on their loadout. Industrial mechs will be pushed more towards a combat support role with remote support module and sensor strength bonuses, while still retaining their primary mining and harvesting bonuses. We’re also making indy heavy mechs a bit more sturdy with a bonus to their armor amount. It’s not all that bright of course, so don’t be surprised if there will be also nerfs to some robots’ specific bonuses. Mk2 robots have special bonuses and those will stay as they are, but basically Mk2s (and other special variants like prototypes) will get the same treatment as their normal counterparts. These can still change as we will still go through all of these modifications again in the coming week. It will also hit the public test server first since we’re of course curious about your feedback too, so we don’t have an exact schedule for this other than “soon”. Although this report is mainly about the impending and shortly upcoming changes, don’t forget that the larger updates outlined in the September and May status reports are still in effect. So the next blog post should tell you more about the incoming second stage of our mission system revamp. Or maybe another one inbetween about the teleport and highway network revamp? Our latest expansion, Gamma Frontier has been out for a month now. According to your feedback, terraforming and colony mechanics are generally good, but there are some bits that need tweaking. Although the public test server helped us tremendously in solving bugs, the balancing aspect of the whole system is something that is still an ongoing effort. Last Thursday we had a successful DEV - Player conference with selected representatives from major corporations, who shared their ideas and concerns on gamma mechanics. (There is a recording available here.) Although some of the issues have been already discussed on the forums before this, establishing the “big picture” with the people who had the most hands on experience with the system itself proved really productive. This blog is meant to present our proposed solutions to the raised issues, separated into different sections regarding how long it would take to implement them, if you agree with them. So imagine an extra “would” beside all the changes listed here as you are still free to tell us how completely wrong we are, or iterate on the ideas. Issue: Building on gamma is too expensive, needs to be more accessible. Increase the manufacturing unit of construction blocks to 5. This means a manufacturing cycle will produce 5 blocks instead of one, so effectively this will also reduce its individual component cost, and thus, its price. Halve the manufacturing time of construction blocks. Since they are the most frequently used buildings, reduce the components in energy transmitters and energy backbones to 20% of the current amounts. Remove infinite NPC-seeds for building foundations, so players can set their own price. Issue: Terraforming is too expensive/slow. Reduce the price of terraforming charges to 20% of their current value. Restore the old terraforming cycle time bonuses to harvesting-specialized robots (5% per controlling extension level - 50% max reduction), by switching back their current defense-related bonuses. Increase the cycle time of terraforming modules by 15% to not make them too fast. Issue: The risk of losing your whole gamma colony overnight is too high, and other issues connected to MPC defense. Make every building able to enter emergency mode, except for command relays and turrets. This narrows down the risk of losing a base to the time frame when the owners are actually able to defend it. Implement multi-phase emergency mode for main terminals only: this is somewhat similar to how beta outpost intrusions work. Depending on the technology level of the terminal, it has a counter of 3 to 5 times (for standard, advanced and hi-tech terminals respectively) when it can subsequently enter emergency mode. Every time the terminal goes into emergency mode, this counter decreases, and every time a phase passes without emergency (2 days), the counter increases. Once the counter reaches zero (ie. it enters the last possible emergency phase), the terminal becomes destroyable after the last emergency phase, like it is currently. Thus the worst case scenario (ie. not even one successful defense in between) for a standard main terminal would be 3 times 2 days (plus the set emergency offset time), so around 7-9 days. Make newly built main terminals invulnerable for 72 hours, to make starting off on gamma less of a gamble (of course they can’t enter emergency phase either during this time). Issue: The teleport construction range issue. It seems that the consensus is that the increased range is a good idea, so we’ll stick to the 2000m no-build zone around gamma teleports, as that is the safe range where a fully boosted hi-tech turret can’t reach anymore. And we promise to discuss such features with you in the future before announcing them as an immediately incoming change. Keep minerals from spawning in the no-build zone. Issue: Gamma reimbursements required due to changes. Reimburse the price difference of all purchased terraform ammo in proportion to the new market price. Reimburse the price difference of all purchased construction blocks in proportion to the new market price. Issue: Not enough to do / not enough rewards on gamma islands. Double the number of normal military and industrial roaming NPC spawns on gamma. Add an elite NPC into roaming spawns on gamma. Remove level 1 artifacts from gamma, keep spawning only level 2 and 3. Make artifacts spawn only on passable terrain. Issue: Too few NPC spawns in general, with emphasis on starter islands. Increase all normal (non-starred) distress beacons to 10 waves. Issue: General changes to minerals. Although the cost of noralgis incubators has been already considerably reduced, and the mined amount per cycle has been doubled in the expansion, we plan to increase both the maximum harvesting cycles, and the additional cycles per growth phases in noralgis (exact figures to follow). Issue: General improvements to gamma. Terraform suppression building: slows terraforming in a certain radius for everyone. Owners can easily turn it on and off if they want to make changes to the terrain, but it can slow down offensive terraforming when active. MPC Aura buildings: basically a copy of outpost auras. Place down a building and select an aura it should provide for the owner corporation’s members on the island. Turret priority setting: set up a priority list for turrets that controls which classes of robots they should attack first. Make turrets return fire when attacked, regardless of relation settings. Issue: Just stuff we've been working on. Spark teleport: this has been announced way back, but now I’m happy to tell you that this feature is close to complete. What’s it good for? You can place down teleport targets in any terminal or outpost you are, and you can teleport your spark back to it from any other terminal in the world, for a certain fee. This means that you can’t bring any robots or items with you, it’s only your bare spark. The feature should make market, production, and remote (corporation) storage management much easier and faster. Private transport assignments: place items into a secured container that only you can open, set a pickup and a destination terminal, add a reward and a collateral amount, and let other players do the transport for you. This was obviously possible so far too and is nothing new, but creating a framework and adding safety rules to it should make it actually a viable mechanic. Issue: Not enough rewards on gamma / Give more meaning to colixum. Completely new tier of modules using colixum. So again, this is only what we propose. The list doesn’t include bugfixes, as those are obviously things that need to be done and don’t need player feedback. It’s also not meant to be a complete and final solution to all the problems mentioned - there is always room for improvement. Now it’s your turn to tell us if we missed something important, changes where you would take a different approach, or even if you simply agree with all this. In order to keep the relevant discussion in one place, please post your opinions and ideas in this forum topic. If we reach a general consensus, the changes in the immediate section could be deployed already in the next patch, expected early next week. Defensive walls are probably the most controversial feature in Perpetuum we have ever had so far. On one hand they are supposed to bring more sand into the sandbox and provide passive defense for whatever you want to defend. On the other hand, many of you have voiced your concerns that it also greatly hinders everyday small-scale PvP warfare, which is hurting the game on a global level. The first introduction of walls went not without issues and we have learnt the hard way that too much freedom can be bad. Based on player feedback, the majority of you think there is still too much freedom regarding wall placement. Initially we didn't want to restrict the building of walls to outpost owners, because we didn't want to shut out the rest of our players from using them. Nevertheless, it seems walls are primarily used for outpost and SAP defense, so we decided to reconsider that stance. It's important to note that currently deployed walls won't be affected in any way by this, as long as you keep repairing them, they will stay there. However you won't be able to place any new wall units outside of the allowed areas. And lastly, to steer things back towards the next part of the PBS series: yes, you will be able to build walls around player-built bases as well, but only around a certain "occupation" area of your own buildings. Official previews, reports, sneak peeks, speculations and rambling by your wonderful Perpetuum developers. May contain traces of epriton.